THERMOFILM™ is a two-sided Release Film engineered for Ultra High Temperature PCB laminations requiring an easy clean release after elevated temperature lamination cycles. Designed to eliminate using inexpertly designed lamination layups, THERMOFILM™, when used with THERMOPADS™ provides the "PACOTHANE®" standard of specific application based attributes. THERMOFILM™ offers the consistent attainment of proper release, surface protection and conformability under the harsh conditions and challenges of elevated temperature laminations. THERMOFILM™ High Temperature Release Film is offered in one thickness of 1.5 mils. (38µm). All PACOTHANE® Release Films are manufactured in accordance to our quality standards which guarantees unparalleled performance. All manufacturing and fabrication operations are performed in house offering total supplier control and accountability. THERMOFILM™ is designed specifically for High Temperature Bondply resin systems such as TK® HT, or LCP where elevated temperatures are used. THERMOPADS™ allow an optimum component package of the lamination Lay-up so the user can eliminate alternative generic substitutes proven ineffective in providing consistent laminations. 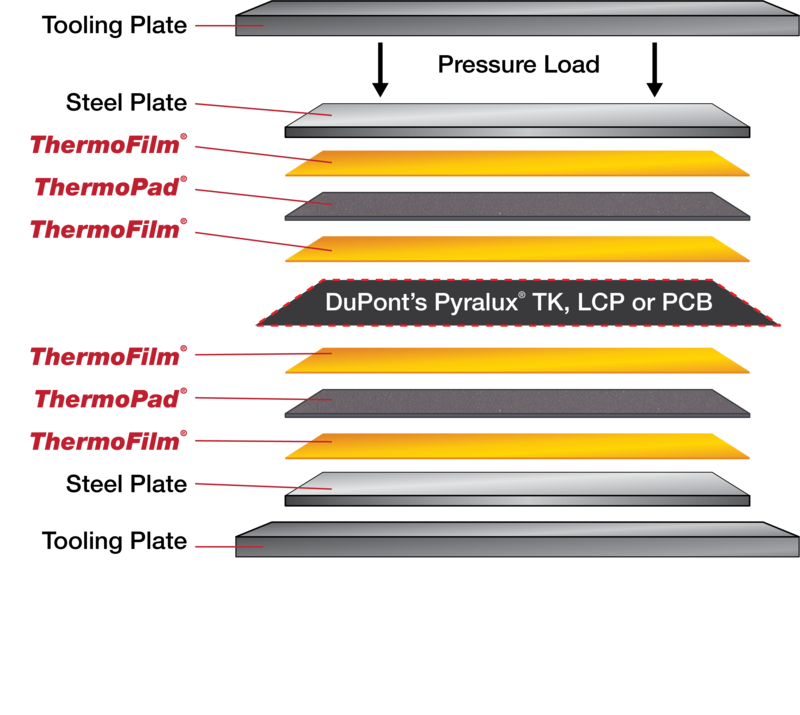 DuPont Pyralux® TK and HT are increasingly popular bondplys used to address increasing High Speed Digital and High Frequency component cycle times specified for emerging technologies on flexible circuit laminates. As a result, there is a definitive need for THERMOFILM™ used with a High Temperature press pad like THERMOPADS™ that withstands temperatures greater than 280°C for extended cycle times. Other High Temperature resin systems such as Polyimide, LCP and PTFE, require higher lamination temperature press pads. The distinct flow characteristic properties of these types of resins cannot be supported in lamination with makeshift components. In order to meet stringent dielectric specifications, these types of applications require a press pad and release film like THERMOFILM™ and THERMOPADS™ that complement each other and provides good thermal conductivity with consistent z-axis pressure distribution for an optimum High Temperature lamination process. THERMOFILM™ High Temperature Release Film is available in rolls and in custom-made sheet sizes, tooled to customer specifications. The complete line of Pacothane Technologies products is available from leading local Distributors around the world who offer "Just in Time" delivery from local stocks.